Truth has been making some really pretty hair styles, and I really like this one called Josette that is newer at his Mainstore. It’s long and very feminine. I’m also wearing a newer necklace from Cae called Transcend – that is at this Month’s Fameshed. It comes with so many options that you can get several different necklaces out of this one. My Explore shirt is from Addams at this month’s Uber. I went over to Crestwick Island to take a picture because I just thought my outfit would be complimentary to the scenery and well I think it is! It’s Sunday which is an easy day to tool around and do nothing so why not go see a place you haven’t been before. Cae made this collar called “Kept” and Cubic Cherry made this rose gag. You can get both of these things at Romp. I am wearing the “When” Hair from Lamb at N21, a dress from Rowne who may still be having a flash sale and my skin is Yolandi from Glam Affair at Summerfest. My pose is from Flowey. Happy Valentines Day, all! I went and checked out the Creepy Kawaii Fair which I really enjoyed. You can go check it out for yourself here: http://maps.secondlife.com/secondlife/ZI%20Chantilly%20Dreams/189/65/530 I picked up a few things that I made outfits into. The first look I’m wearing a new dress from Sweet Thing, Tights from Moon Amore, and boots from Reign that you can get from Creepy Kawaii. You can find these cute little Giraffe’s from Half Deer here as well. The necklace that I’m wearing is new from Cae and the hair is from Tableau Vivant. The second look I have on, the dress is from Moon Amore, the head wings are from Sweet Things, the boots and the head band are from Reign, and the hair is a Gacha from Due – all at Creepy Kawaii. My poses are from Slouch, and my skin is the Amberly II skin from Glam Affair. Fameshed has opened with a brand new round and there are many great things to be found. 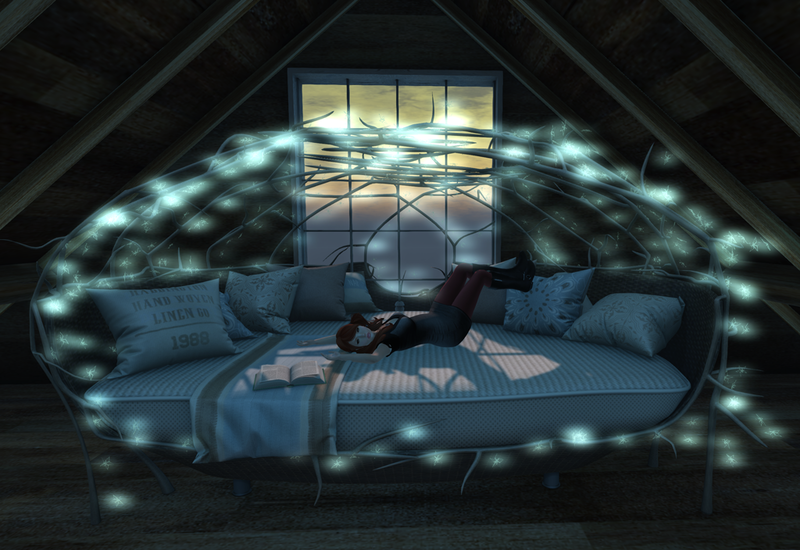 This day bed which is like a human-sized nest and even has soft glowy star lights is perfect for single or couple poses. D’awwwww. I took several photos for this post because I was really liking my windlights this time and I’m wearing a new dress from Bueno, the jewelry is from Cae, the hair is from Wasabi Pills and boots are from Just Design = all at Fameshed. My skin is from Deetalez and I’m using the Soft Mesh head from the Shops. Another event that is going on right now that started the other day is N21. Some of the items this round are limited, and you have a few weeks still to pick them up but I love these ears from Aitui – which are limited. The Broken Heart plugs fit my mood lately and Olive has this hair out called Runa. So pretty. I also picked up this checkered shirt with undershirt (that comes with a nice hud) from Foxes at N21. My jeans are from Maitreya (and are half off right now if you are in the group) These boots are from Maitreya too. My pose is from Slouch. My skin is the Ellie skin from Glam Affair at Kustom9. Right now, going on at the L’amitie Fall Market Cae has a necklace and earring set called Harvest. It’s a really sweet little jewelry set and I’m wearing it in this photo. I’m also wearing brand new hair from Magika, and a cardigan that is new from Eaters Coma at the seasons story. 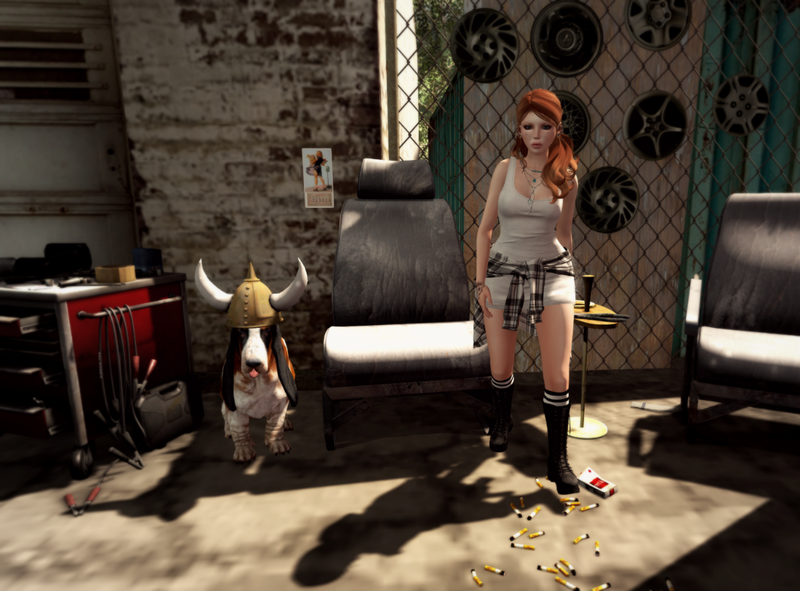 My under shirt is an oldie but goodie from Whippet and Buck and my skin is Penny – from Glam Affair at the Seasons Story.